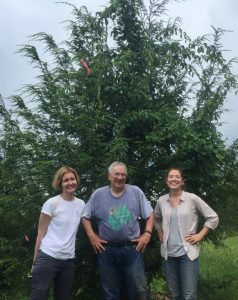 Christy Leppanen, Dan Simberloff, and Kimberly Sheldon pose in front of a southern Japanese hemlock, Tsuga sieboldii. In July, a group of EEB faculty, staff, graduate and undergraduate students, family, and friends helped dig roots as part of a study of belowground communities associated with hemlock trees. 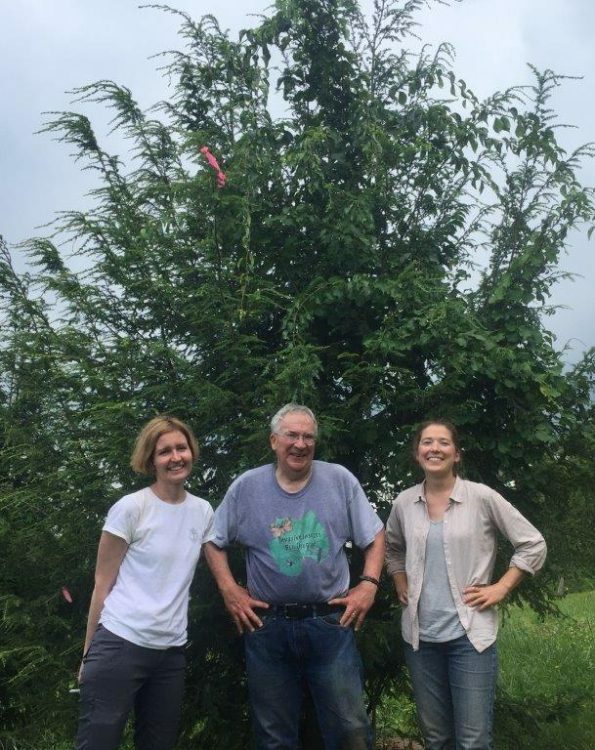 Prof. Daniel Simberloff and Christy Leppanen (EEB lecturer and postdoc), are collaborating with Melissa Cregger (Oak Ridge National Laboratory) to characterize microbial communities associated with native and non-native hemlocks. Some of the trees are vulnerable to infestation by the hemlock woolly adelgid, but some appear to be resistant. The hemlock woolly adelgid (Adelges tsugae or HWA) is a sap-feeding insect introduced in the 1950s from Asia to eastern North America, where it kills native eastern (Tsuga canadensis) and Carolina (T. caroliniana) hemlocks. In Asia and in western North America, HWA feeds on, but does not kill, hemlocks that are native there. Therefore, aspects of communities where HWA is native and trees that are apparently resistant are studied to help understand impacts and develop management approaches where HWA is introduced. EEB graduate students Chelsea Miller (Kwit Lab) and Angela Chuang (Riechert Lab) collect roots and soil from under an eastern hemlock, Tsuga canadensis. 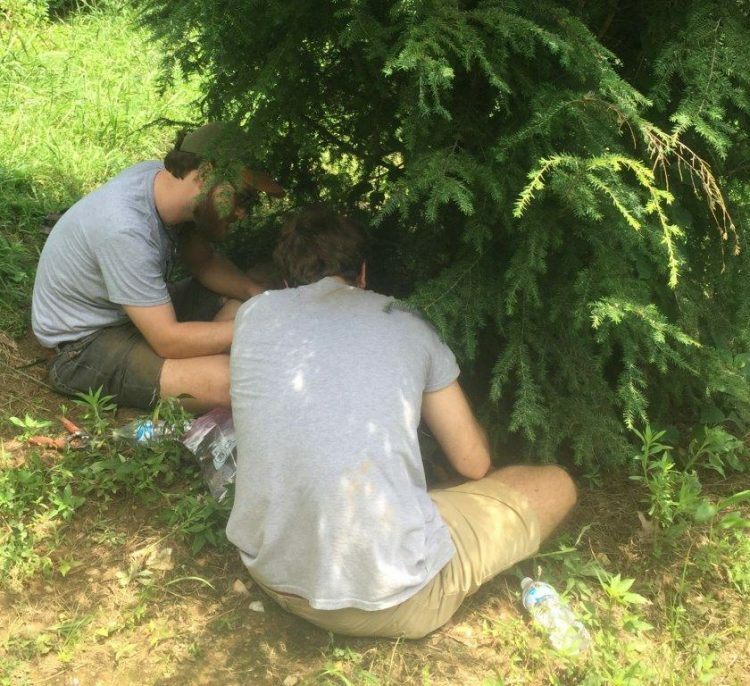 Simberloff and Leppanen traveled with a group of 14 volunteers to North Carolina State University’s Mountain Horticultural Crops Research and Extension Center, in Mills River, North Carolina, to collect roots and associated soil from native and non-native hemlocks that are vulnerable or appear resistant to HWA infestation. From these samples, Cregger will characterize microbial communities: archaea, bacteria, and fungi associated with the different trees. The team will then meet to discuss the results and consider implications and next steps. 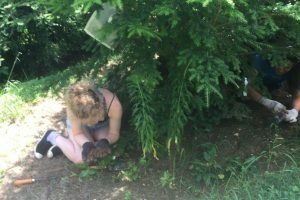 Kylie Hannahs digs under a southern Japanese hemlock, Tsuga sieboldii, with Chase Steele, EEB undergraduate research assistant in the Fitzpatrick and Simberloff Labs. Microbial communities influence and can indicate associated host organism health. Microbial diversity and composition can influence large-scale nutrient fluxes across ecosystems. 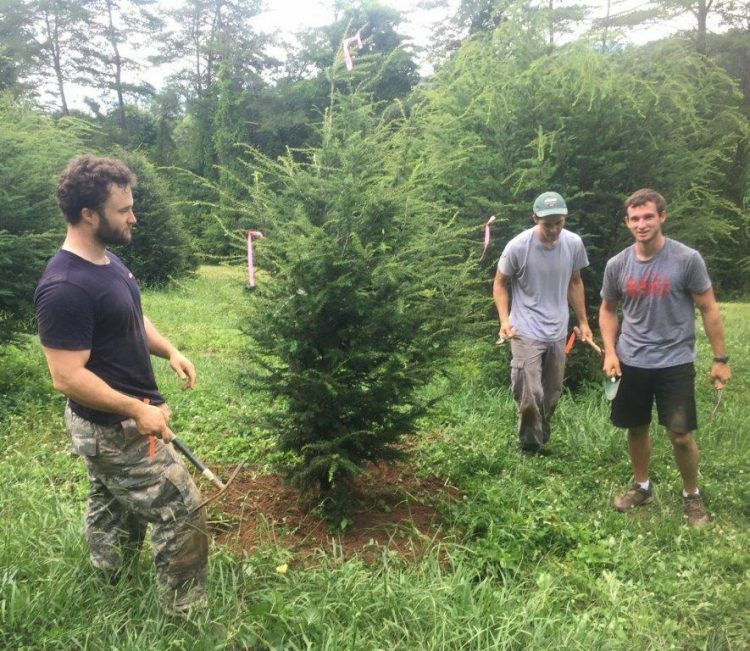 Loss of native hemlocks, or even HWA infestation of living hemlocks, may impact important ecosystem-level processes as a result of losses or changes to associated microbial communities. 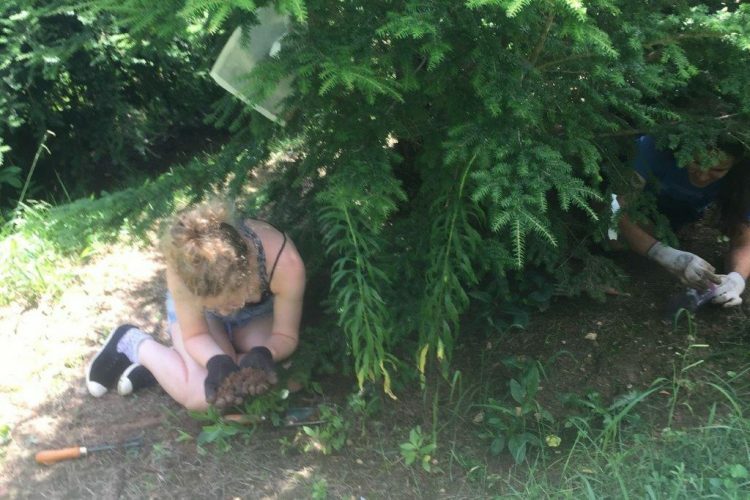 Additionally, suggested replacement of our native hemlocks with non-native species such as the Chinese hemlock (T. chinensis) may have ecosystem-level implications if microbial communities associated with the Chinese hemlock differ. 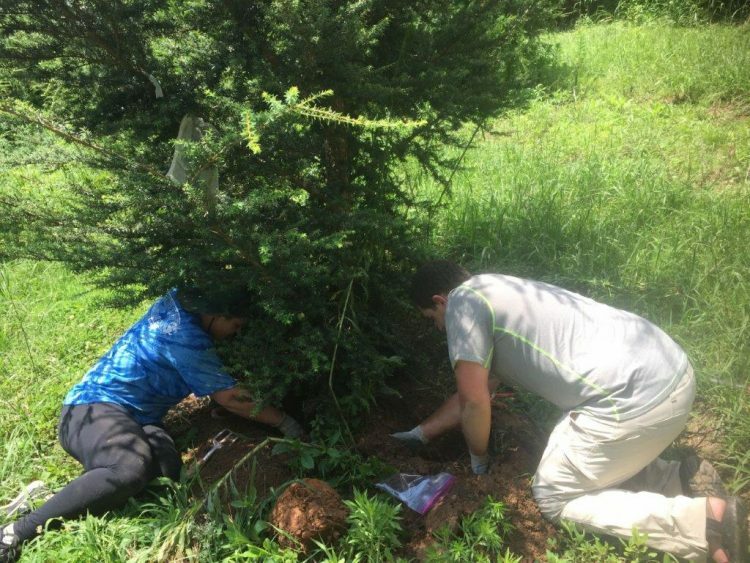 Microbial communities associated with non-native “replacement” trees may not only prevent the return of native ecosystem dynamics but may also influence our native ecosystems in entirely new and unpredictable ways. 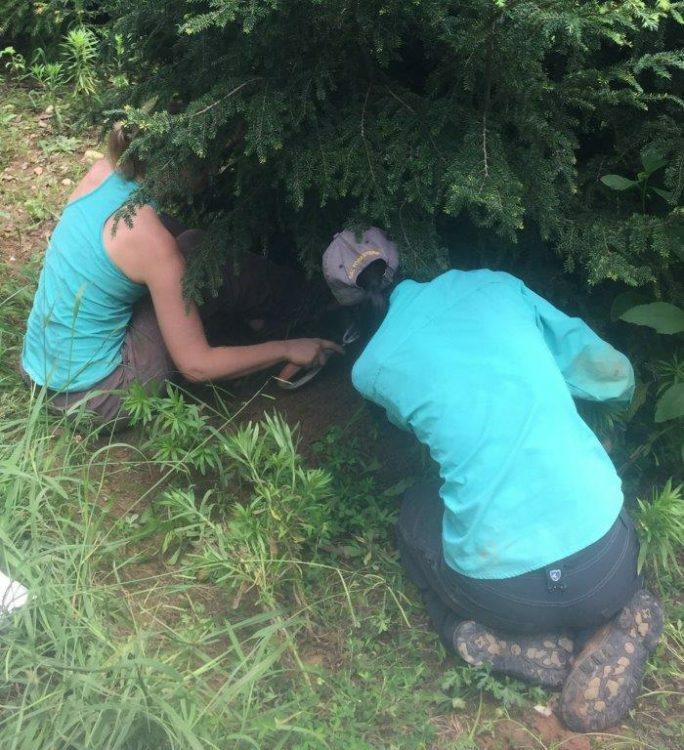 Ruth Simberloff and Frank Scott examine roots under a Himalayan hemlock, Tsuga dumosa. 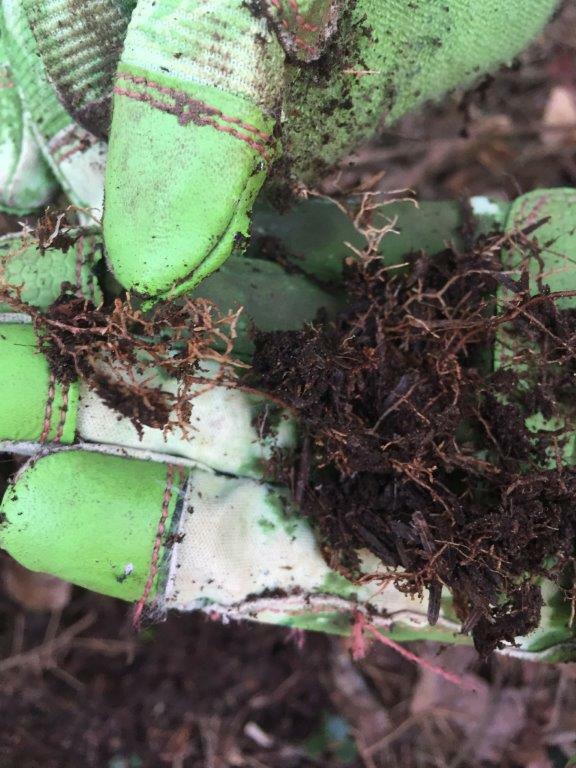 Fine roots are collected to characterize microbial communities associated with different hemlock species. EEB student workers Damon Christensen and Michael Ellison excavate under an eastern hemlock, Tsuga canadensis.